WEST HAM UNITED FC: Z TYPE SOUVENIR PETROL LIGHTER: PERSONALISED TO LEE LOOK !!! It is for Manchester United! 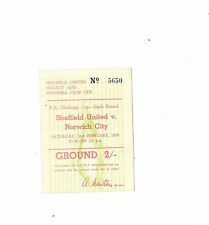 Apparently Park Drive did a run of these cigarette cases for various clubs. The case is made from textured black plastic and has the United logo in gold, and the Park Drive logo in gold. DESIGN: WESTHAM. 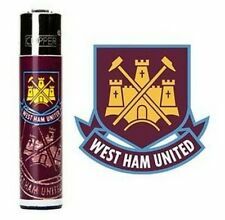 OFFICIAL WEST HAM UNITED FOOTBALL CLUB FLINT CIPPER LIGHTER WHU GENUINE WHAT YOU GET 1 X GENUINE CLIPPER LIGHTER. - WEST HAM UNITED FC. - LIVERPOOL FC. 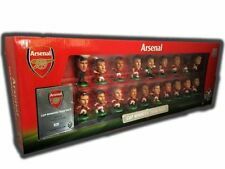 PERSONALISED TO 'LEE' . ZIPPO TYPE SOUVENIR PETROL LIGHTER. WEST HAM UNITED FC . Condition : good, the gas must be refilled. 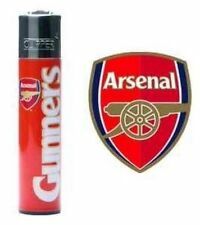 OFFICIAL ARSENAL FOOTBALL CLUB FLINT CIPPER LIGHTER WHU GENUINE WHAT YOU GET DESIGN: ARSENAL. 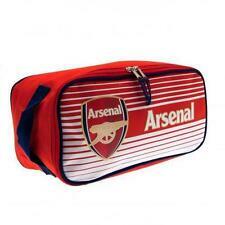 - ARSENAL FC. 1 X GENUINE CLIPPER LIGHTER. Lighter zippo style With liverpool the reds football emblem on the front.